Ron Sledge of King Bearings. Advancements in engine simulation and CAD software along with very precise CNC machines have opened the way for numerous shops to design and build their own engines. We’ve featured some of these innovators in the past, such as Mike Moran, Goodwin Competition, CFE Racing and Steve Morris. While the big parts can be cut out of billet, many of the smaller parts require the help of suppliers. For example, you can’t machine a set of main and rod bearings for a custom block. Custom bearings can be developed at King Bearings for clean-sheeting engine designs. 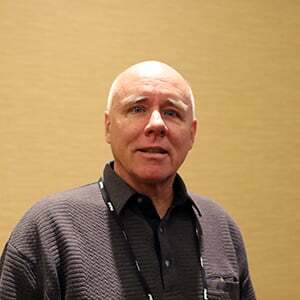 “If you were to come to me and say we’re going to develop a new engine, then we need to figure out the bearings,” says Ron Sledge, performance and technical manager at King Engine Bearings, who revealed the design process in a presentation at the recent Advanced Engineering Technology Conference (AETC) held just before the PRI show. Again, sophisticated software is the key as King engineers utilize an in-house developed simulation package called ENSIM that calculates and predicts bearing performance. King can also draw from a wide range of bearing materials and geometry features to design a bearing for specific applications. ENSIM is a software tool at King that analyzes engine dynamics to help design the right bearing. “We run theoretical calculations for in-cylinder combustion pressure at any position of the piston and then calculate the forces applied to the connecting rod and main bearings at any crankshaft angle,” explains Sledge, adding that these numbers help the engineers narrow down the hydrodynamic lubrication parameters for the bearing design, including minimum oil-film thickness, maximum oil pressure and energy loss as a function of bearing geometry, temperature, engine rpm and more. The ENSIM software provides theoretical calculations for bearing load and other factors to help engineers develop correct bearing dynamics for different applications. The first step for the engine builder is to fill out an in-depth questionnaire that asks for the basics such as bore/stroke, compression ratio, power numbers and cam timing. But it also goes into meticulous detail like rotating weight, firing order, coolant temperature and oil-hole locations on the crankshaft. Here are the pros and cons of loose or tight bearing clearances. Once the theoretical data is analyzed, engineers can test prototypes on a test rig that simulates loads on the bearing. King engineers balance of the pros and cons of loose and tight clearances to recommend a number. 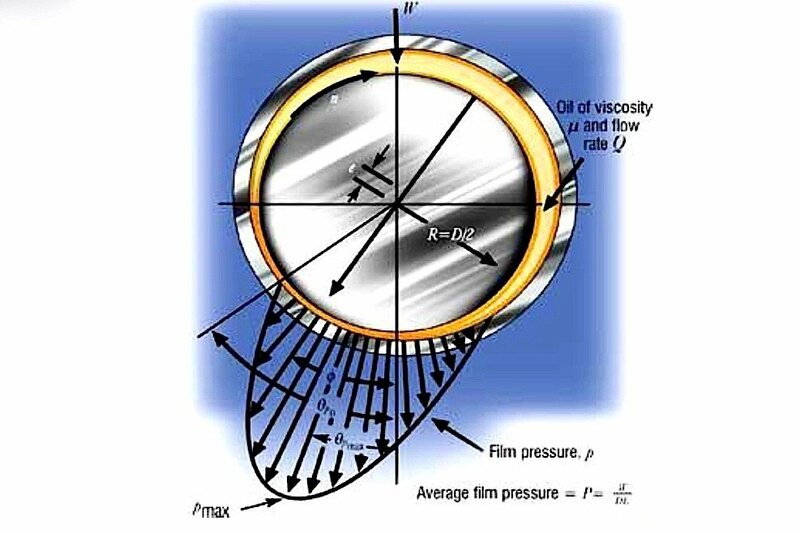 Illustrations show the fundamentals of eccentricity in bearing design. “What we’re after is the maximum minimum-oil-film thickness,” says Sledge, noting the the clearance will affect oil pressure distribution, oil flow and oil temperature. One of the most frustrating experiences for any engine builder is getting a set a bearings with wide differences in the wall thickness. King believes the conventional tolerance of wall thickness is plus or minus .00025-inch, or “2-1/2 tenths” in engine jargon. This means engine builders often have multiple sets of bearings so they can “fish” for the right shells. King has implemented a state-of-the-art production technology with computerized monitoring that tightens up that tolerance. The U-groove from King Bearings is designed to increase load-bearing capacity by expanding the surface area without affecting oil flow. King doesn't recommend oil grooves unless there is a problem with getting oil to the rod bearings. As you can see in the illustrations on the right, there is reduced load capacity with a grooved bearing. Accurate construction dimensions also help with another bearing dynamic that is crucial to engine performance: eccentricity. Bearing thickness is always greater at the bearing crown than the sides. The ElliptiX is a newly designed oil slot/oil hole that compensates for misaligned block and bearing holes. Another priority is the crush height, or the difference between the outside diameter of the bearing and the diameter of its housing. This slight extension of the bearing past the housing edge, called the crush height, helps promote radial pressure against the housing to ensure a secure fit and provide sufficient heat transfer. Other features available on King bearings include a U-groove that increases load capacity and a unique oil slot/oil hole hybrid design called ElliptiX that increases oil passage capacity and eliminates the need for custom oil hole enlargements. Once the design is set, King then draws from a wide variety of materials and construction options to finalize the bearing specs. Whether bi-metal or tri-metal, and whether coated or uncoated, the bearing will be designed to fit the individual needs of specific engine applications. 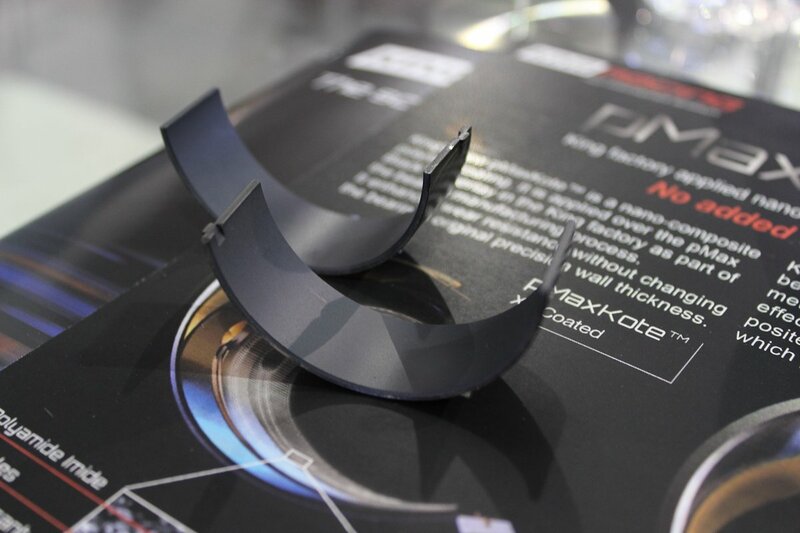 King recently came out with its first line of coated bearings called the pMaxKote. It’s designed with no added wall thickness, so coated and uncoated bearings provide the same oil clearances. This test showed how the King bearing, far right, held up in a mixed lubrication regime at 10,150 psi for 24 hours compared to other leading brands.